Are you a plant lover? Well, we imagine that you are, as there are very few of us that don’t appreciate the atmosphere that a few ornamental plants can create with their rich, verdant greens or brightly coloured flowers, whether in the garden or the home. They offer a sense of peace, a connection with nature and they fill us with a sense of excitement as we watch them grow, producing new leaves and buds which burst into flower. Huertocity has expanded its range of products to include a new, innovative and exciting vertical garden system. It’s beauty is in the simplicity, a series of felt panels with individual pockets for individual plants and flowers, 12 pockets to a panel. The felt is 100% recycled, and the system is handmade. 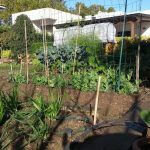 The pocket system facilitates installation, and the substitution of plants that reach the end of their natural cycle (annuals as opposed to perennials). The panels are isolated from the wall with a plastic impermeable backing to prevent any possible chance of water damage and its clever design makes it one of the lightest systems on the market. The fibre used in the felt is highly resistant and non toxic and with just the right porosity to allow water to filter through. This permits all the plants in the panel to be watered homogeneously allowing healthy root and therefore plant growth. We offer the installation of this system in Barcelona and the surrounding towns and villages. Nowadays it is well known that there are numerous benefits associated with houseplants. A multitude of studies have been realised, including by NASA, that have demonstrated that plants help to regulate the humidity and environmental temperature, they reduce pollution, purify and improve air quality and can help alleviate physical and mental stress through their calming action. The vertical garden allows us to create green zones in places with limited space, improving greatly these benefits. · generate enough air for one person to breath for a year! Our system is ideal for people that forget to water plants, those people that claim not to have green fingers (or thumbs, depending where you are from!) or simply for people who think there isn’t any room for more things in the house! 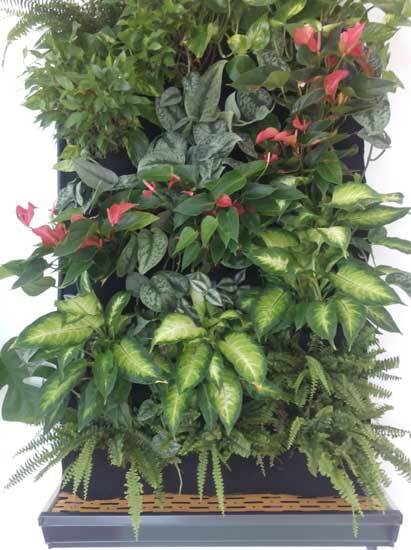 Our vertical garden system will fit into any space that has a wall, it really is that versatile, and with an automatic irrigation system, you can leave the carefully selected choice of plants to look after themselves. Additionally we offer a maintenance service for those that don’t feel confident or for projects in offices, retirement homes or other such places where additional services are required. As this is a modular system we can design and build a garden that fits your exact needs, any size on any wall, adapting it to the space available space. A careful selection of plants not only ensures a long life for the vertical garden but also facilitates the design of intricate patterns using their different colours and textures. In the design above there is a simple but stunning red curve created by the anthurium (Anturium andreanum) – imagination is our only limitation! If you are interested in a vertical garden in the office, care, home, or private home, the process is the same and equally simple. Call or write to us and we will arrange a free, no obligation visit to see the space and discuss the project with you. Following this you’ll receive a free quote, that will be competitive and based on the humidity, temperature and light conditions unique to each individual room. 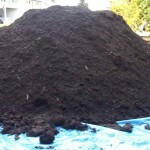 This information will allow a careful and optimal selection of plants. 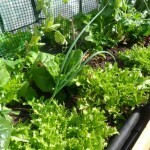 Below are just a few examples of common plants that can be used in the vertical garden system. It is by no means a definitive list but simply to provide food for thought. Should you have specific plants you want to include, whether annuals or perennials, wherever possible, conditions allowing they will be incorporated into any designs we suggest.